Shamus Award nominee and recipient of the Lifetime Achievement Award from the Private Eye Writers of America. BAD NEWS & TROUBLE – Before Kinsey Millhone, Sharon McCone and V.I. Warshawski, there was Delilah West, the sensitive, gutsy and resourceful private eye who shattered the boundaries of mystery fiction…starting with the ground-breaking short stories in this collection. DEATH IS FOREVER – – Ex-cop Delilah West is working as a PI with her husband Jack when he’s killed while investigating a missing person’s case. Grief-stricken and enraged, she becomes obsessed with finding the killer…only to wake up drugged in a skid-row hotel room with him lying beside her with a knife in his back. It’s the perfect frame, nailing her for an obvious revenge killing. Now she’s on the run…living on a razor’s edge trying to avoid capture while searching for the murderers who’ve destroyed her life. RUN FROM NIGHTMARE – When thirty-year-old Janet Valek dashes off to some small desert town and doesn’t come back, her worried family hires PI Delilah West to check up on her. Delilah gladly accepts the mundane case. 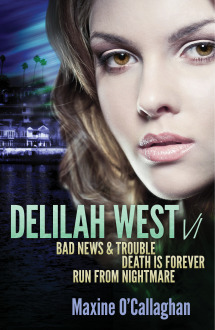 Delilah is still reeling from hunting down her husband’s killer and has as buried herself in routine cases ever since. The more routine the better. But it turns out that Janet has vanished, and when corpses turning up dead. Delilah fears Janet may be in a shallow grave…and discovers that there are people who would like to put the feisty PI in one, too. The fourth book in the ground-breaking series. PI Delilah West tries to clear the name of a dead woman framed for embezzlement…and becomes the target of a letter bomber.